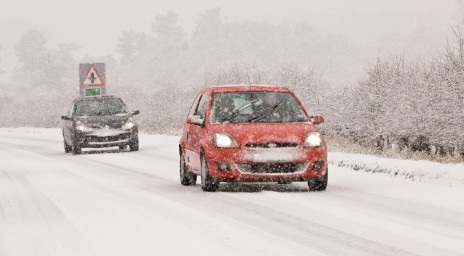 The best advice for driving in severe weather is not to do it, although some journeys are necessary and although driving in wintry conditions can be tricky, there are a few things you can do to better prepare your car and your driving to aid a safer drive. • Make sure your battery is charged. • Check that your headlights are clean and working. • Make sure you have sufficient tread on your tyre's (3mm is advisory in winter conditions). • Make sure fluid levels are correct Screenwash, Engine coolant (with sufficient antifreeze), Oil level. • Make sure wipers and blades are in order and working. • Make sure your car has plenty of fuel in it. • Make sure all the windows are clear from snow and ice. • Make sure the roof is clear of snow (in case it slides down the window). • Turn off the in car electrics (radio, demisters, heater until the engine is running) before trying to start the engine. • Press the clutch in before trying to start the car (it will take some load off the engine). Things to carry in the car. • Mobile phone fully charged (with in car charger if available). • Blankets, warm clothes in case of breakdown. • Food and drink (chocolate bars, flask of tea etc). • A tow rope and a hazard warning triangle. • A torch can be quite handy (with batteries), or wind up equivalent. • Appropriate footwear incase you need to walk in the snow. Delivering competitively priced and top quality driving lessons in Rothwell | Aberford | Allerton Bywater | Barwick in Elmet | Colton | Fairburn | Garforth | Halton | Kippax | Ledsham | Ledston | Micklefield | Crossgates | Roundhay | Scholes | Seacroft | Swillington | Whitkirk | Woodlesford.